The first major commercial airline in more than 20 years has landed at Mogadishu airport in war-torn Somalia. Turkish Airlines says it is the start of a regular service to the Somali capital, the first by an international carrier from outside East Africa. 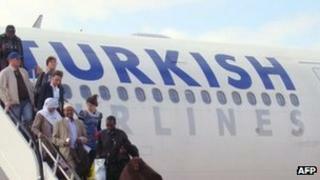 Turkey's Deputy Prime Minister Bekir Bosdag was on board the flight, which was welcomed by the Somali president. The twice-weekly flights should make travel easier for Somali businessmen and members of the large diaspora. Somalia has not had a functioning central government for more than two decades and has been riven by factional fighting. Islamist militants were pushed out of the capital by Africa Union and government forces last August - although they have continued to stage attacks in the city. The BBC's Mohamed Dhore in Mogadishu says security was tight and the main roads leading to the airport were blocked off ahead of the flight. Turkey - Somalia aid pioneers? The plane was greeted by a large Somali government delegation, including President Sheikh Sharif Sheikh Ahmed, as well as UN officials and ambassadors. "Today is a big day for Somalia," Somali government spokesperson, Abdisalam Mohamud, said. The flight follows a visit to Mogadishu last year by the Turkish Prime Minister Recep Tayyip Erdogan - who said he wanted to challenge the idea that the Somali capital was a no-go area. The start of the service was announced by Turkey's foreign minister during last month's international conference on Somalia in London hosted by the UK government. World leaders have pledged to boost support for measures to fight piracy, terrorism and political stability in Somalia by substantially increasing international funding for the African Union military operation in the country and working more closely together. Our reporter says a group of women were singing and dancing as the plane touched down on the tarmac. "It is a very positive step, and one of many steps that we are now seeing in the last six or so months. We are quite happy to see that normalcy is returning," a Mogadishu resident told the BBC. Turkish Airlines intends to operate a twice-weekly passenger service from Istanbul via Sudan's capital, Khartoum. "We will connect the Somali people to the rest of the world. We hope that in the near future Somalia will become a stable place, a very normal country," an official from Turkish Airlines, Faruk Sazar, said after landing. Somali Foreign Minister Abdullahi Haji told the BBC's Somali Service he felt the service would improve links between the international community and Somalia. "It will also make it easier for the Somali diaspora to come home. It will bring us closer together," he said. "I believe it will also encourage peace and development." Several private East African airlines, including Kenya-based African Express, now fly into Somalia from neighbouring countries - but for many years Mogadishu's international airport was out of action, controlled by rival militia groups. Al-Shabab, the Islamist group which joined al-Qaeda last month, is under attack on several fronts, with troops from Kenya and Ethiopia also gaining ground recently. But the group still controls much of southern and central Somalia - and says it will wage a guerrilla war against the government.